But, here’s the deal: I’m excited. A Dinner with Titans is a story I’ve been working on for a little over a year, rotating through several drafts, and finally arriving at the one I’m about to let loose. As I’ve stated before, it’s a story about the hearts of people and honestly, I can’t think of a better analogy for the heart than a castle. You’ve got your defenses; you’ve got your high towers of solitude; you’ve got your isolation – the works. But, you’ve also got your beauty, your strength, and your safe haven. All the things that sum up the human experience from a heart perspective. I’ve tried my best to do the analogy justice. It was no easy task and I’m sure when I read it later, I’ll be wanting to add more. There’s just so much ground to cover and within the context of a single fiction, it’s hard to tackle it all. My main character, “Caretaker,” has to do just that. However, the big question I’m after is this: what is it about our hearts that make us want to protect and give them away so willingly? That’s where I’m going with this story. Why and how do make these decisions. Why do we let some people in, but shun others? And how do we deal with the pain when it comes our way. My Caretaker has to make these choices throughout and I’m hoping the reader can relate to each of these in his own way. First off, much thanks to Diane Zizka – the one responsible for this cover piece. Thank you for your talents and hard work! It was much appreciated. I can’t do anything with watercolors. You’re a pro. 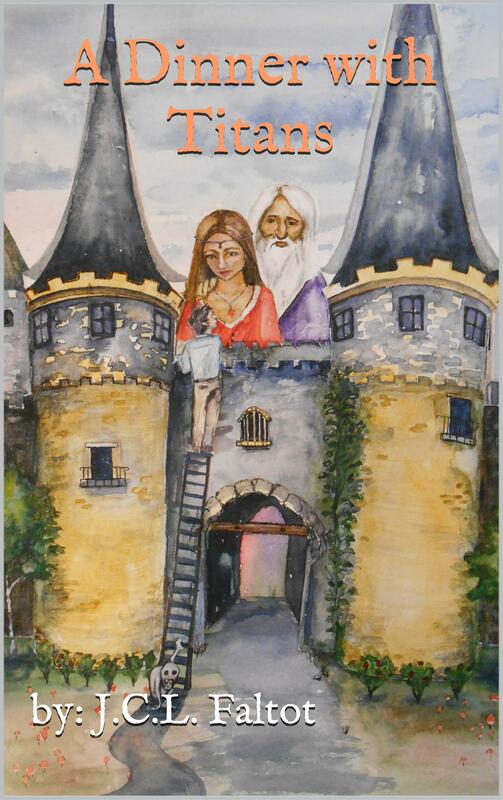 My February story follows a young man, Caretaker, who owns a castle in the wilderness. Everything’s fine except for one thing: he is surrounded by Titans, huge beings that destroy castles (like the Caretaker’s) and rule the land outside his walls. Over the years, the Caretaker has watched others fall and crumble, leaving him lonely and cut off from the world. But, the Caretaker makes a bold move and lifts his doors for one night – to host a dinner. For the Titans. His goal is to somehow make peace with those who might threaten his castle. But, when he opens his doors, he encounters something terrible. Not just the Titans themselves, but something sinister that has been eating away at his castle for years. Okay – as you can guess, this story is a fantasy. But, I’ve written it as an analogy for the human heart. The Caretaker lives alone, behind his walls – guarded and afraid; fearful of being overtaken by the ‘Titans’ – the people we idolize or aspire to be like. His past experience tells him to keep his distance – to stay safe inside his castle – but his real enemy is not what’s outside his walls, but what’s inside. When I was high school, I was asked to bring in an object representing love. I brought in a tiny paperweight. One that was shaped like a castle (terrible, right?) and honestly, I had no good explanation for it. But then I had to tell the class my reasoning, and I remember that presentation ending quite well; lack of preparedness and all. The ‘home is where the heart is’, but in my story, it’s a castle. Looking back, I never dreamed I’d actually write a story about that concept, but hey, I’m a believer now. I’ll have some more stuff to chew on with the next post. Till then. My latest ebook, The Color of Soul, is a story about two brothers. Sometimes, I feel like that’s all I need to say about it. When you’re talking brotherhood, you’re talking a unique arrangement. It’s a predetermined connection; started at birth and continued for life. And it doesn’t matter if you like the arrangement or not. You’re “stuck”, but you’re also incredibly blessed at the same time (and for the record, the same can be applied to those with sisters too). In my life, the term ‘brotherhood’ has real resonance. For starters, I have five brothers of my own. All ranging from mid-forties to early twenties; me somewhere in the middle. With so many faces, it’s easy to get lost in the crowd. But, the company around you is eerily similar. It’s like looking in a mirror and seeing some of you, but not all of you. You see much of your own self in them, and conversely, they get to see so much of themselves in you. My brothers and I share plenty of familiar interests. We share certain viewpoints, beliefs – even mannerisms. And that’s not including how much we look like alike! But, at the end of the day, we’re different men. Each with his own life; his own trials; his own challenges to face. Which brings me to this story. You see, I have brothers ahead of me, but I also have brothers behind me. I’ve been the “big brother” a long time, but I’ve been the “little brother” much longer. I know what it’s like to look up and see the next in line. I saw my older brothers with a golden lens and I wanted to be like them, if I could. When I got two younger brothers, things changed a little. I found myself wanting to return the favor. I wanted to share interests, share insights, and ultimately, share life. Just as I had with my elder brothers. I didn’t know it then, but I’d come under a strange burden: being a big brother. As an older sibling, you tend to feel a sense of guardianship. It’s not as demanding as being a parent – that’s a truth, but it’s a place where you can learn what it’s like to look after someone. And it’s completely voluntary, too. You can make the investment in your younger siblings, or you can choose not to. It’s really that simple. My characters, Curtis and Fin, share a mutual investment with one another. They are brothers, yes, but their journeys are vastly different. And each brings that journey to the table; literally and figuratively in this story. So here’s hoping you enjoy. The Color of Soul is now available on Kindle. In keeping with my book-a-month challenge, I’ll be releasing another ebook this weekend, The Color of Soul, on Kindle. And yes, the black and white cover was intentional. This one is shorter than last month’s, The Scientist’s Dilemma, and follows two brothers who have sat down to craft a story together; two creatives bouncing ideas off one another, making something original, and using plenty of color to do so. Told through the voice of the elder brother, Curt, this was a story I literally wrote in about two weeks. I’m not short-changing the effort, I just wanted to tell a story between brothers. I have five of them myself. It’s an interesting dynamic and I’ve enjoyed it greatly. It felt good to touch on that in this short story. What’s more, I wanted to produce something simple. Something that was original and something that was unique. I feel this story does some justice in that arena so I’m pleased with that. I’ve always been intrigued with how color affects mood. Each has a specific feeling attached to it. The brothers point that out rather poignantly throughout. Right down to the core. Since it’s a shorter story, it moves along rather quickly and my hope is that people can read it in an hour or two. But, if it takes you longer, then that’s just as well. Moving forward, my other hope is to have The Color of Soul in audio format. So as I prep for February’s next release, I’ll be working towards my first audiobook. Much thanks to my friend, Kris, who has been schooling me in audio training. It’s clearly been needed and I’m grateful. More to come on that later, but for now, The Color of Soul is slated to be available on Saturday, January 24. And for those who read The Scientist’s Dilemma, there are a few “easter eggs” in The Color of Soul for you. Enjoy. So Your Book is Out – Now What? Yesterday, I finally got to release The Scientist’s Dilemma on Kindle. Might go without saying, but hey – that was very exciting. It’s surreal knowing my thoughts and ideas are now open to praise, criticism, and verbal shellackings. I’m sure I’ll never tire of the high it gives me; be it for good or for bad. But, when the day is over and I’m lying in bed, an annoying question may creep up and invade my thoughts: so what now, Josh? Obviously, I have some options when that happens – four of which I find to be the most immediate during this process. My first option might be to keep checking up on my story. The Internet is a double-edged sword in this way. I can track views, likes, clicks, purchases – just about everything other than tracking my readers via satellite are some things I can do. And yet, if I’m not careful, I can find myself staring down the rabbit hole of never-ending browser clicks; hoping and praying that someone may have shared my link, viewed my webpage, or took the ultimate chance and made a purchase in the last five seconds. Yes, the dark side of tracking one’s book can be dangerous. It’s nice to know how things are going, but if that’s all you’re doing then you’d best get to doing something else. My second option would be to keep posting information about my book. Of the first two, this is the one that keeps things moving. A good business practice is to operate with forward motion. Lingering over concepts or ideas for too long creates stagnation and if you’re interested in being a professional writer, you have to view yourself in that same way. Your name brings a certain product and people – as nice or as thoughtful as they are – don’t always remember to check out your book. So you must remind them by continually getting yourself out there. This can be a tough one to execute and must be done with the level of charm that doesn’t turn people away. Again, a double-edged sword, but if worked at, can become a powerful asset in your arsenal of online marketing. Am I pro at this myself? Oh, heavens no, but I’m learning as I go and this has proven to be a major part of what helps to build one’s platform. My third option would be to look for more opportunities to share my work. I can post and connect links and write as many blog posts as I like, but I may be just working inside of a vacuum. With that in mind, it’s good to take a moment and think, “what am I not doing that I haven’t done before?” For this particular venture – The Scientist’s Dilemma – I decided I should only release it as an ebook. In the past, I would have scoffed at doing such a thing. “That’s too small. Either get recognized by an agent or nothing,” – that was my thinking. And with that stubborn attitude, I probably missed out on some opportunities along the way. The downside here is looking back in hindsight, but there is a silver lining also: any chance you didn’t take doesn’t really matter anymore. If you’ve arrived at a point where it’s easy to look back and say, “should’ve done that” then you can ultimately use that to your advantage later. Learn what works and what doesn’t, but don’t try to recreate old scenarios for the sake of just trying to prove yourself. My fourth (and last) option would be to work on the next project. It’s in these times when I can feel the most invigorated or the most demoralized. To know that my next work could be months, maybe even years away, is a daunting feeling. All sorts of doubts and dreadful thoughts can surface – and they can come from inside my own head or even come from the tongues of those around me. The key in beating this is to be decisive in what project you choose to undertake. Oftentimes, I’ll find myself floundering between ideas, unable to get a solid grasp on what the best use of my time will be. This is normal though and is a natural part of the process, but it’s also not something to dwell upon or beat yourself up over. If anything, it might be healthy to have more than one project going at a time. Journaling is a good deterrent and can be very beneficial in flushing out the gunk that clogs things up. I’ve found journaling to be very helpful. All that being said, back to it. I got some options to work with. The Scientist’s Dilemma… Here at last! I am once again diving into uncharted territory with the release of my short story, The Scientist’s Dilemma, and I’m excited, to say the very least. I’ve spent a good deal of time making this work known in one way or another so this is the moment of truth. I’m finally getting something out there again. That’s a great feeling. The past 12 months have been difficult, but good. I felt challenged by something that said to “write smaller” and here is the result of that acknowledged challenge. So after writing several short stories and needing to grow in specific areas, I was feeling confident enough to put another work out there. It’s not to say that this was at the top of that pile, but it’s the one that felt the most appropriate. My first two books were essays; this is a straight fiction. My first two books were rather angst-ridden and littered with hard questions; this story has served as one way to absolve some of those anxieties and quell the desire to have all the answers at once. In retrospect, I think it all makes sense now. But, enough of all that. 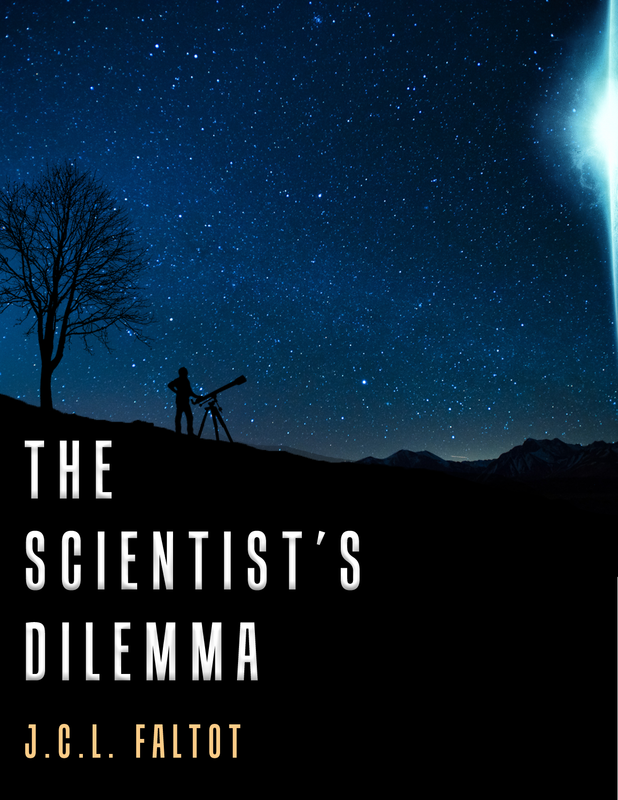 My hope is that if you’re reading this, then you’ll consider giving The Scientist’s Dilemma a read and ultimately be encouraged, if not entertained, by it. Many thanks to Andrew DePolo, one half of the Twin Composers, for creating this slick cover. Looking forward to the next one we can cook up. The Scientist’s Dilemma – December 4th!! It’s nice to have a solid release date and I have one. I’ve been posting, tweeting, and Facebook-statusing lately about my short story, The Scientist’s Dilemma, but I’ve been neglecting to mention when it will be arriving. So here it is: Thursday, December 4th for Kindle and Kindle apps. No paperback, no hard cover, just electronic this time around and it’ll be starting at $3.99 per download in the U.S.; an amount that will vary in other parts of the world. So I hope you’re one of the folks who has the capability to give it a download soon. No matter what part of the world you’re in. And that’s it for shameless self-promotion and now onto a small amount of self-reflection. It’s been over a year since I last published something and I forgot how nerve-racking the anticipation can be. As a writer, you must knowingly enter a certain mindset prior to releasing your work. The reason being that when you are putting something out to the public – one such as The Scientist’s Dilemma – you are inviting a wave of opinions, thoughts, critiques, and hopefully a small amount of praise directly to your doorstep. A good analogy would be standing on the other side of a dam, pulling back the gates, and taking a deep breath as the wave comes crashing over. Yes, I’m sure that sounds overly dramatic but sharing stories is like trying to impress total strangers with a good joke at a party. Your acceptance – your initiation, if you will – is dependent on so many things: knowing your audience, having a strong delivery, and ultimately giving a compelling message. All three of those have to come together if your goal of making new friends will come to fruition. The same applies to writing and sharing a good story. And if I’m lucky enough to make some new friends then hey, that’ll also be a win in this newest of endeavors. I’ll be releasing this short story in just a few weeks. It’ll be available for direct to Kindle only – so no paperbacks. It’s not as lengthy as a full scale novel and it’s not the first in a trilogy, but it’s a story that has a significant place in my heart. And that’s as good a reason as any to share it, I figure. The title alone isn’t meant to be a complicated one. This story is actually about a scientist and it’s actually about a dilemma too; one that just so happens to belong to the scientist (told you it was simple, didn’t I?). That’s the premise of this tale and it’s a premise I believe so many other people – even those without the title of ‘scientist’ – find themselves struggling to answer at one point or another: just what the heck are we all waiting for? It’s a huge question to tackle; overwhelming to some and perhaps strangely intoxicating to others, yet it’s a question I find simmering under the surface of practically every person I run into. Or have the pleasure to read about. That strange hunger that rises up within and says, “I don’t know if I belong to this world alone. Is there something else?” In my case, it’s a question I’ve pondered on many-a-starry night, which is why I like the cover so much. It represents that curious nature any person possesses and it’s an image that ultimately brought legs to this story. What’s waiting out there to be discovered? Is there anything at all? The universe is a big place and has plenty to offer while we’re here, but sometimes looking out is an easy alternative to looking in. Talking about persistence is one thing and actually being persistent is another. Some people get caught up in the notion that being persistent means holding onto a certain thought or idea. And if they hold tightly to that idea – that thought forever circulating in their minds – then something will eventually happen to make that thought a reality. Obviously, this is not the case. Thoughts require action to become tangible. They (thoughts) need more than inner-mindedness; in other words, they need you to do something other than keep that idea a prisoner in your head. Growing up, I was always more of a cautious soul. I didn’t like getting in trouble or disobeying my parents or even getting less than an A- on my tests. I’ve never liked the idea of letting people down and that attitude has permeated every facet of my existence for nearly 30 years. The danger in that thinking, however, is a stark and very dangerous desire for absolute perfection. Perfection in work, perfection in relationships, and perfection in every endeavor I take on. It increases expectations; it makes them – the expectations – practically impossible to ever reach and instead of embracing a good risk in life, you become paralyzed; afraid to ruin that perfect record of endless success. It’s maddening, to say the least. But, I’m not here to appeal to all you other Type A’s out there who can’t stand when another person takes the driver’s seat or to say that it’s “okay” to demand perfection of yourself and others – no, the meaning of this message is to redefine what is considered bold behavior. What does that look like and what does it mean? To the cautious soul – like myself – bold behavior could be seen as intolerable actions. Breaking the law, rebellious acts, challenging an authority, even violence – may be among what many would consider “bold” moves. But, none of those behaviors are boldness in action or boldness in its truest form. It’s actually immaturity or a lack of understanding – not being bold. I’ve wrestled with the courage to be bold for a good portion of my life so I know how complicated the first steps of acting bold can appear to be. Especially if you’re someone like me. It’s maddening, as I said, but it doesn’t have to be. When I felt the call on my life to pursue this professional writer business, I was racked with “analysis paralysis”; just like I’d always been. And when that familiar feeling arose, I wanted to back off and think it too much to handle. But, the shift happened when I stopped trying to appease that perfect image of who I wanted myself to be in other people’s eyes, and changed that view to who I really was inside – and who God had desired me to be. A pursuit of perfection isn’t as much about the person as it is about the people around that person’s life. Who are you trying to appease? Who is it you are trying to gain approval from? If it’s not yourself or God, then who is it? There must be someone you’re trying desperately to impress and if that person has a name, then break free from that. It’ll be one of the first bold moves you make as an individual. As for me, my next bold move will be releasing some of my unpublished short stories. Again, I’ll be attacked with “analysis paralysis,” but I don’t fear it as much as I used to. It’s just another bold step towards the wholeness I’m meant to pursue, not the perfection I thought I deserved.